I’ve been thinking quite a bit about my five senses lately and I think I’ve come to the conclusion that I like my sense of smell. Or at least I like it when I smell something that reminds me of a place or a person or a happy time. Over the summer, many of you know, I worked at a campground and every day for a couple weeks, my coworkers and I would swim in the lake. Afterwards, I would quickly wash my hair and rinse off before once again donning my khakis and polo to go back to the dining hall for dinner. The shampoo that I used had a very distinct scent but I discontinued the use thereof after the summer because I’d always heard it’s good to switch up your shampoo periodically to keep your hair healthy. (Though I must admit I usually change it out of boredom rather than concern for the health of my hair…) At any rate, I recently switched back to that shampoo and the mere scent of it made me miss my campground and my campground people. There are other scents that I love that also have stories but I won’t go into them now. Instead, I’ll make a list. the mixture of cigarette smoke and cologne. Actually, I don’t like that one any more. I take it back. Just cologne. Smoking is disgusting. certain clean old people smells. I thought I smelled it in one of the academic buildings the other day. I almost let myself think someone was here that wasn’t. the smell of Zest makes me think of my grandparents and spending nights at their trailer at their campground. toast on a Sunday morning. We’ll leave it there. I’m getting too nostalgic as is. I really miss some people this week. I’ve been holding off on writing them letters until I know for sure about my living situation for next semester. We shall see. I’m not really sure what they’ll think about it so I’m going to leave the somewhat important part out. But I’d really like to hear from/talk to them. I’m probably going home this weekend and I get to see Casie and the girls. I love them. Plus Casie just got an Apple and I want to play with it!!! Well, C-Dubs must needs read some Thoreau— Walden, joy— so I will go. I hope you all have fantastic days. Hasta. Anyway, I cannot get over Pete’s Dragon. It’s so cheesy but magnificent at the same time. You should go find it and watch it somehow. I’m just saying. I’m going to church now. Hope you all have a great day. May this be me Lord. Help me to be alive in you and to love you more and more each day. God, let me be on fire for you. I don’t want to be lukewarm any longer. I have finally reached the end of Tuesday. I had an exam at 8:30, a presentation at9:55, and work from 11:15-2. Then I got to eat some “lunch.” While doing so, I was distracted by Pastor Dave in the Union, thus losing a good half hour of writing time. Of course I lost enough writing time by just being me. Ha. Anyway, it was a good distraction. Anyway, at 10:57 pm, my paper is finally done and submitted, albeit 44 words short and somewhat incoherent toward the end. Suffice it to say, today has been stressful. But it’s over now and I can absolutely revel in the fact that my housing situation is 90% definite, I get to write lots of letters tomorrow, and I’ve accomplished quite a lot today. Not to mention Connie Button is now on Facebook. That pretty much made my week. And now I’m IMing a future housemate. That situation is possibly one of the most exciting things to happen to me in a long time. Anyway, I really should go to bed. It’s after11 and I have to get up around 7 tomorrow morning. There’s lots I should share with you all but well, I really need to sleep because… I love it. In closing, a letter to my bed. How could you doubt that I would make our meeting mostly on time? You know I would sacrifice anything, including my academic success, to rest in your sweet embrace at day’s end. PS I just got a funny IM that was mostly a grammatical error/typo but I’m not allowed to share it. It saddens me. The photograph you see before you is of my first Valentine of the “season.” On Saturday night, I worked at the “Sweetheart Banquet” at O–B–C. It was a lot of fun, very busy and lots of people. I only had a moment or two wherein I wanted to smack certain people but we won’t talk about that. Sunshine came in a few minutes before Chief. When Chief came in he gave me a hug and told me I was his favorite college student. That was probably a lie but I don’t particularly care. Anyway, the meal was relatively uneventful. Beulah was crazy as usual and Thelma and Evelyn were pretty stressed. After the meal and after most of the cleaning up was done, I was getting my stuff because the Lindermans, my ride up, wanted to go. When I walked into the kitchen I noticed Chief holding some flowers; I assumed they were Donna’s. When I came back out from the closet where the aprons are kept, Chief was standing there and he gave me the flowers. I don’t remember what he said exactly, something about the young men and Valentine’s Day but it meant a lot to me. 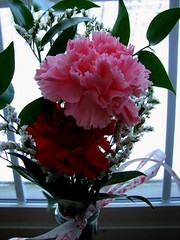 So even though I hate Valentine’s Day, those flowers were the first Valentine in a long time that made me smile a lot. Thanks Chief, if you ever read this. I watched The Bucket List today instead of reading like the good student everyone wants me to be. And it was really good. (Gulliver won’t mind that I postponed reading about his travels.) Though it does have its negative points, overall it had a positive message about the things that really matter in life. (For a full review, head to Plugged In Onine. In addition to these priorities though, there are some things I would like to before I die. Some of them I’d like to do before I finish my undergraduate work. So I guess the rest of this entry will be me listing that. But before I get to that, I’d like to challenge you to think about where your priorities lie and what things in life you consider worth doing. travel all over Europe, specifically the United Kingdom. Anyway, hope that makes you think a little. I guess I’ll go back to reading Gulliver’s Travels instead of thinking about my own.